During my last shoot with Tony, we had the Food Network on. I got completely enthralled with The Barefoot Contessa’s Thanksgiving show…and particularly her tomato basil palmiers that she was making. The recipe sounded easy and delicious, which are the two most important factors in making little nibbles for holiday gatherings *and* holiday blog events, like the Festive Food Fair being hosted by Anna at Morsels and Musings. The secret here is the puff pastry. Folks, I have to say…nothing is easier and gives you more bang for your buck during the holidays. You can wrap virtually *anything* with puff pastry and get ooohs and aaahs from your guests. For this recipe, you can make your own pesto or used pre-made for an even easier time of it. I think you could also use various spreads and fillings inside your palmiers – a little prosciutto and mustard might be divine! Unfold 1 sheet of puff pastry and place it on a lightly floured board. With a rolling pin, lightly roll the dough until it’s a 13-inch square. Using a knife, spread the paste over the top of the puff pastry. Fold the sides of the square toward the center so they go halfway to the middle. Fold them again so the 2 folds meet exactly at the middle of the dough. Then fold one half over the other half as though closing a book. You will have 6 layers. Slice the dough into 3/8-inch slices and place the slices, cut side up, on baking sheets lined with parchment paper. Brush each piece with egg wash and place in the oven. Bake for 6 minutes. Turn each pastry slice over and continue baking an additional 5 minutes. i really love using puff pastry-everyone thinks I’m a cooking genius-ha. I also like the Barefoot Contesa-she is so calm and mesmerizing. First off, I’ve lurked forever are really love your site. I’ve got about 20 bookmarked, and yours is one I check almost daily. So kudos to you, and thank you — it’s great. Second, I saw this post and wanted to share this palmier recipe that calls for mustard, honey, and proscuitto. I originally found a very similar recipe on the site of a culinary school I considered attending, but I couldn’t locate the recipe again. Instead, I found this (link below). I’m not sure it is PRECISELY the same as the one I originally made, but it is VERY close. It’s an audaciously-excellent blend of sweet, spicy, salty, chewy and crunchy. I think I ate roughly 425 of these in one sitting. Puff pastry is definitely worth its weight in gold. My standy by appetizer is chorizo sausage and smoked chedder wrapped in puff pastry and slice into medallions. 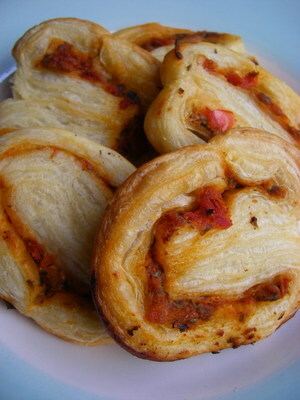 i agree completely – puff pastry is a must have in the freezer because you can turn the mundane into the spectacular. thanks for joining my event!